Amherst, MA, 16 March, 2009--More than 20 women who have settled upon the fertile ground of the Pioneer Valley (Connecticut River Valley) have created new artworks that will premiere in New York City at Tabla Rasa Gallery from April 18 – May 30. Many of these female artists are transplants from many parts the country, such as curator Brooklyn native Terry Rooney (whose mother was born on the same street as the gallery), who will bring her Statue of Liberty series to New York for the first time. Several of the Pioneer Valley artists have blazed new frontiers with their artwork and studios. Rosalyn Driscoll explores the tactile nature of sculpture and encourages viewers to touch her work. Liz Chaflin, the founder of Zea Mays, created the only independently owned non-toxic print studio in New England. Erika Zekos presents a model of her “Shedding Light” public arts project honoring farmers with a solar-powered tobacco barn, advancing “green energy.” Ruth West forged new techniques combining computer art with encaustic in her artwork. 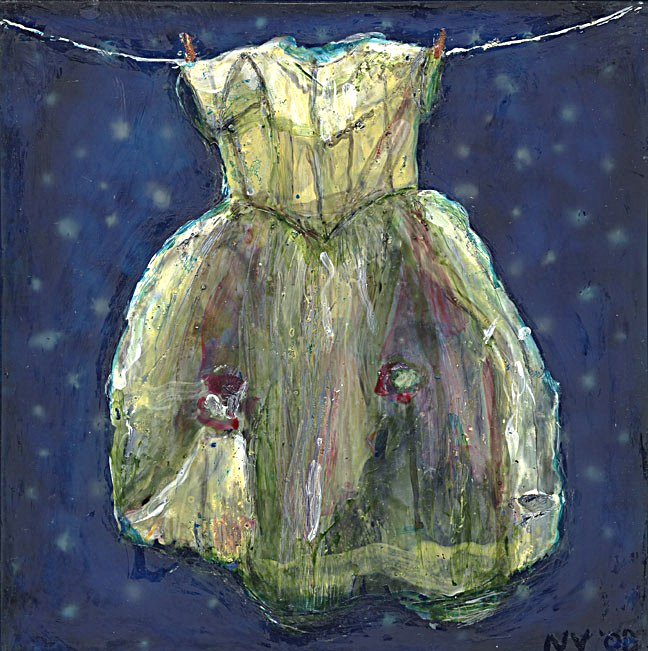 Deborah Kruger also uses encaustic in an unusual way: she invented a process using wax with fabric. Another fabric artist, Deidre Scherer creates moving images using fabric and thread, to address the issues of aging and mortality. Rachel Folsom, Elizabeth Pols and Terry Rooney push the edges of painting with their painted sculptural constructions. Belinda Lyons-Zucker adds a contemporary twist with her African wrap dolls creating an Obama supporter doll; one of her creations has just been selected for the Smithsonian Museum. This is the first time some of the “Pioneer Women” are exhibiting in New York City. Others, such as Karen Dolmanisth, who has exhibited at Exit Art and Smack Mellon, have exhibited all over the world. Many of the artists have been honored with museum exhibitions, including Oriole Farb Feshbach, whose work has been featured at the Springfield Museum, MA, Fitchburg Museum and the New Jersey Museum, Trenton. Ruth West was the first computer artist in residence at Giverny Monet’s garden in France. Deidre Scherer has a traveling museum exhibition called “The Last Year” which recently toured museums in Florida and is presently at the Greenville Museum in North Carolina. Among the additional artists are Anne Burton, Cynthia Cosentino, Rita Edelman, Alix Hegeler, Mary Ann Kelly, Lauren Mills, Susan Montgomery, Holly Murray, Nancy Miller, Mo Ringly, Diane Savino, and Nanny Vonnegut. 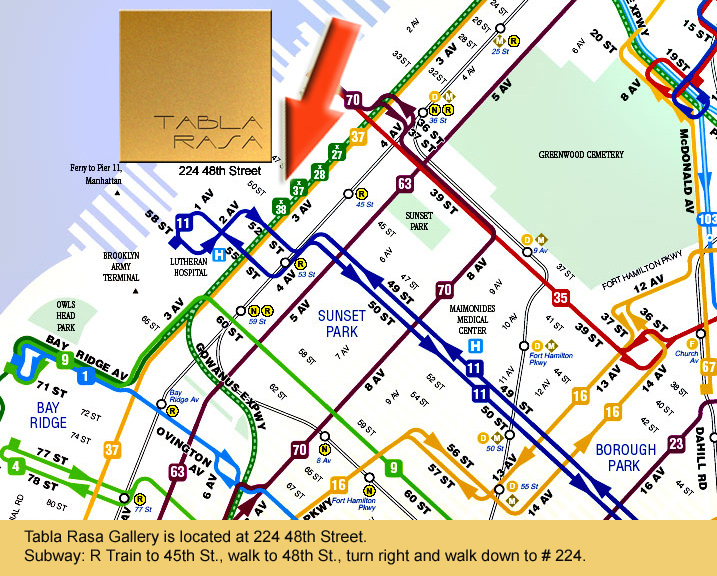 The gallery is located a few short "R" subway stops beyond Park Slope, at 224 48th Street, between 2nd and 3rd Avenues in Brooklyn. From Manhattan, "D" or "N" express train to 36 Street in Brooklyn, cross platform, and take "R" train one stop to 45th Street. Street parking is available. General gallery hours: 1:00 - 5:00 pm, THURSDAY, FRIDAY & SATURDAY.